New York Yearly Meeting's Earthcare Working Group works to raise awareness in the yearly meeting about earthcare concerns, coordinate the efforts of individual Friends following earthcare witness leadings, and serve as an organizing vehicle for collective earthcare action within the yearly meeting. Statement of support for the Standing Rock Sioux in their protests against the Dakota Access Pipeline. Press release distributed with the statement of support, September 7, 2016. Written and distributed in collaboration with NYYM Indian Affairs Committee. Days 1–4: Quaker Earthcare Witness Report. Click the following to visit the People's Climate March web page. The March takes place September 21, 2014, in New York City, with New York Yearly Meeting as a participating organization. Local Friends are organizing a Quaker contingent and hospitality for Friends coming from a distance. 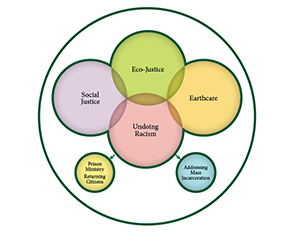 Click the following link to learn about Earthcare Working Group's Earthcare Connectors, Friends who are traveling to local meetings to share their leadings regarding climate justice and living lightly on the earth. Introduction. At its Summer Sessions in 2014, New York Yearly Meeting approved new priorities for the Yearly Meeting intended to align the work of the Yearly Meeting's committees and working groups, its staff, and its institutions, with local Friends' priorities as discerned by the Priorities Working Group from its 78 visits with local meetings and worship groups. Energy Efficient Travel Options flyer. Reduce your travel carbon footprint.